After trading deep in negative territory as recently as 7:29am ET, the Dow Jones index surged, and is now well in the green thanks just to one stock: Boeing. The key DJIA component reported earnings that handily beat expectations, while raising profit and sales forecasts for the year: Q3 core EPS of $3.58 solidly above $3.47, while Q3 revenue of $25.15BN printed above the highest estimate, and clearly well above the median consensus estimate of $23.91BN. Impressively, free cash flow climbed 37% to $4.1 billion in the third quarter, Boeing said, compared with the $1.9 billion average of analyst estimates compiled by Bloomberg. More importantly, and benefiting from both ravenous demand for airliners and military conflicts around the globe, Boeing sees full year EPS of $14.90 to $15.10, solidly above the consensus estimate of $14.64. Previously Boeing saw year core EPS $14.30-$14.50. The company also boosted revenue guidance from $97.0BN-$99.0BN to a new range of $98BN to $100BN, higher than the analyst consensus of $98.47 billion . The company also expects full year cash flow to be between $15.0 and $15.5BN, meaning a whole lot more stock buybacks are on deck. It wasn't just booming aircraft sales: Boeing also took a $691 million charge for costs that are expected to exceed revenue as the company develops military contracts it recently won, for a refueling drone for the U.S. Navy and a next-generation trainer jet for Air Force pilots. The strong results were especially impressive because, as Bloomberg notes, investors had low expectations for the third quarter after supplier strains left dozens of unfinished 737 jetliners, the company’s main source of profit, parked around a Seattle-area factory. 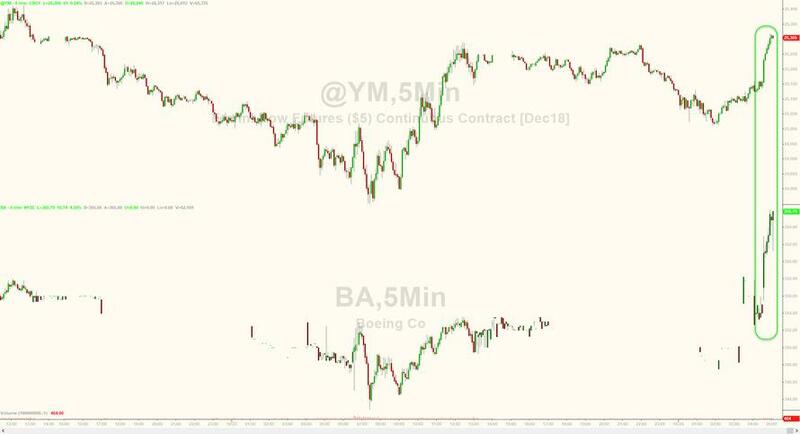 The market reaction was impressive, with Boeing stock surging 16$, or 4.6%, and sending Dow Jones futures surging, with the fair value suggesting a green open to the tune of +140. And that's how just one stock has changed the mood in the entire market: for those wondering, Dow is up around 7pts per $1 so Boeing up $16 means 110 Dow points or so.